Fracture is a major cause of failure in metallic and non-metallic materials and structures. An understanding of the micro- and macro- mechanisms of fracture enables materials scientists to develop materials with high fracture resistance, which in turn helps engineers and designers to ensure the soundness and integrity of structures made from these materials. The International Congress on Fracture is held every four years and is an occasion to take stock of the major achievements in the broad field of fracture, to honour those who have made lasting contributions to this field, and to reflect on the future directions. - High Strain Rate Fracture and Impact Mechanics. For structural integrity scientists and engineers concerned with the mechanics and mechanisms of fracture, fatigue and strength of materials and structures. Volume headings and selected papers: Preface. 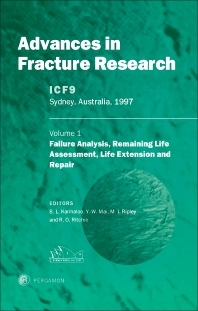 Volume 1: Failure Analysis, Remaining Life Assessment, Life Extension and Repair. Linking scales in fracture mechanics (J.W. Hutchinson). Creep-fatigue crack growth in power-plant materials and components (A. Saxena). Design for cyclic loading in transport (R.A. Smith). Experimental and numerical investigations on ductile-to-brittle transition in a carbon steel (Cheng Yan, Yiu-Wing Mai, Shang-Xian Wu). Interaction between hydrogen diffusion and crack growth in hydrogen assisted cracking (J. Toribio, V. Kharin). The role of oxidation on the creep behaviour of a commercial purity nickel (M.C. Pandey, S. Srinivas). Prediction of fatigue interaction from static creep and high frequency fatigue crack growth data (K. Nikbin, J. Radon). Failure analysis of adhesively bonded joints (C.H. Wang, L.R.F. Rose). Volume 2: Failure of Multiphase and Non-Metallic Materials. Analyses of debonding in metal ceramic systems (V. Tvergaard). Interface and deformation micromechanisms in composite materials (Sri Bandyopadhyay). Fracture of fiber-reinforced ceramics at elevated temperatures (J. Llorca, M. Elices). Failure of cohesive granular materials (S. Van Baars). Fracture behaviour of reinforced ultra high strength concrete beams with stirrups (J.P. Ulfkjoer et al.). Analysis of contact stresses in ceramic laminates (X.Z. Hu, H. Wang). Volume 3: Fatigue of Metallic and Non-Metallic Materials and Structures. On the growth of fatigue cracks in advanced ceramics and intermetallics (R.O. Ritchie). Fatigue design in engineering materials (J.F. Knott). Fatigue and fracture retardation using a thermo-mechanical method (Y.C. Lam). Fatigue crack growth in particle-reinforced metal matrix composites (F. Ellyin). Influence of moist atmospheres on fatigue crack propagation (J. Petit et al.). Probabilistic mechanics modeling of fatigue crack growth and fracture (A.B.O. Soboyejo). The calculations in a whole process of fatigue-damage-fracture for components (Yu Yangui, Tan Jianrong). The effect of small defects and residual stresses on fatigue (T.C. Lindley). The effect of peening on the fatigue life of aluminium alloys (P.K. Sharp, G. Clark). Fatigue crack propagation and crack closure in grey and austempered ductile cast irons (Li Wenfong, M.N. James). The effect of tempering temperature on the high cycle fatigue properties of high strength spring steels (K.A. Lee et al.). Fatigue crack growth studies on lug joints (K. Satish Kumar et al.). Volume 4: Theoretical and Computational Fracture Mechanics and New Directions. A more concise systematization of unified fracture theory (Takeo Yokobori). Evolution equations of stable and unstable crack propagation (A. Neimitz). Asymptotic analysis in fracture (J.R. Willis). A topology based system for simulating 3D crack growth in solid and shell structures (B.J. Carter et al.). A cell model for ductile fracture with applications to the transition regime (C. Fong Shih et al.). Thermal stress cleaving of a thin strip using a point heat source (A. Saimoto et al.). Branching problem of a crack and a debonding at the end of a clamped edge of thin plate (Norio Hasebe et al.). Shear fracture mechanism in a recycled aluminium alloy (D.M. Li, A. Bakker). Volume 5: Testing and Characterization Methods, and Interfacial Fracture Mechanics. Tensile fracturing in dynamic compression (Sia Nemat-Nasser). New methods for characterizing fracture toughness behavior (J.D. Landes). Small specimen fracture toughness characterization - state of the art and beyond (K. Wallin). True shear and mixed mode fracture toughness testing of materials (K.W. Lo et al.). A study of testing method and mechanisms of stress corrosion cracking performed on stainless steel (H.X. Zhao et al.). Engineering treatment model (ETM) for creep crack driving force estimation (Li Zhonghua et al.). Volume 6: High Strain Rate Fracture and Impact Mechanics. Unstable neck formation as a precursor to ductile fracture during high-rate planar extension (L.B. Freund, N.J. Sørensen). Issues in dynamic crack propagation (F. Nilsson). High speed fracture in polymers and composites (J.G. Williams). Dynamic analysis of a propagating interface crack (Y.S. Ing, C.C. Ma). Impact fracture process of plain concrete with large size aggregates by means of Hopkinson bar bundle (C. Albertini et al.). Constitutive equations for special linear viscoelastic composites with growing damage (R.A. Schapery). Nanomechanical fracture-testing of phenol-formaldehyde thin films (D.A. Boismier). Effects of plasticity on toughness measurements in laminated systems (M.D. Thouless). Index of Contributors.